Recommended for protection of unoccupied facilities. Economical, computer-designed and engineered; using total flooding, hand hose line and/or local application. The most technologically advanced CO2 fire suppression systems available. Colorless, odorless and electrically nonconductive. Rapid cleanup equals minimal downtime. 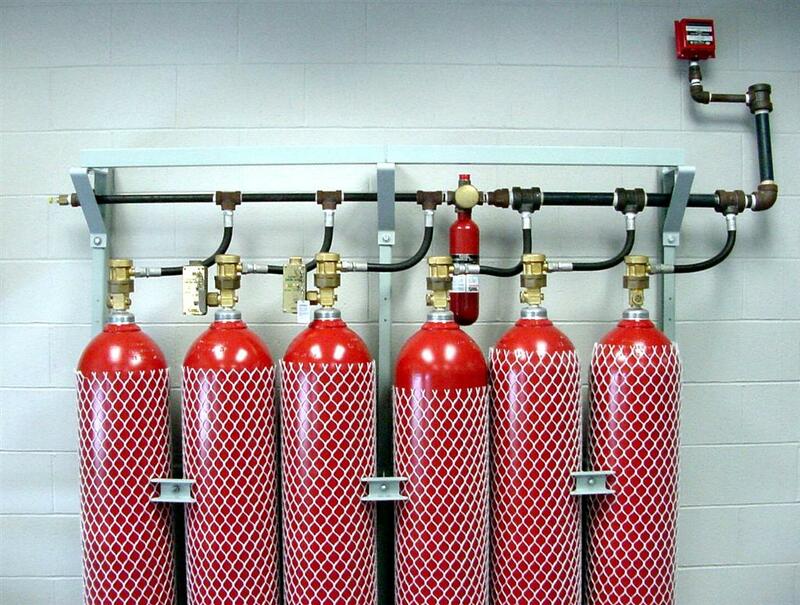 We install Kidde Carbon Dioxide (C02) fire suppression systems. C02 gas has a high ratio of expansion which facilitates rapid discharge and allows for three dimensional penetration of the entire hazard area quickly. Carbon Dioxide extinguishes a fire by reducing the oxygen content of the protected area below the point where it can support combustion. 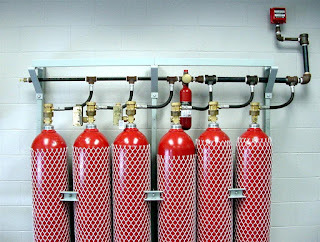 Carbon Dioxide Fire extinguishing systems typically store the agent in one of two different ways, high pressure cylinders, or low pressure CO2 tanks. When designed, engineered, and installed properly, Carbon Dioxide fire suppression systems will not damage sensitive electronic equipment. Carbon Dioxide has no residual clean-up associated with its use as a fire suppression agent. Carbon Dioxide fire extinguishing systems can be used to protect a wide variety of hazards, from delicate electronic equipment to high-voltage electrical equipment, all without causing damage to the equipment being protected. • Reduces the oxygen content of the atmosphere to a point where combustion becomes impossible. A Carbon Dioxide Fire Suppression system consists of one or more banks of cylinder storage containers to supply the CO2 extinguishing agent. Flexible discharge bends, or hoses, connect the cylinders into a piping manifold. The manifold in turn distributes the agent into the piping network. Nozzles regulate the flow of CO2 into the protected area. Before Carbon Dioxide is released into the protected facility, fire must be detected by a detection and control system. We use the Pegasys addressable control panel for Kidde systems and the Auto pulse control panel for CO2 systems. We have extensive experience in the installation and design of CO2 fire suppression systems; in fact we have installed and maintained CO2 systems since our inception in 1999. We have worked with major corporations to design CO2 systems nationwide for a variety of applications. Call today and speak with one of our knowledgeable professionals. A carbon dioxide fire extinguisher can mean the difference between a total loss from fire and minimal damage. It is an effective piece of equipment if you know when and how to use it.